Join the fight against otherworldly beings including Cthulhu, Hastur, Yog-Sothoth, and Shub Niggurath. The same game as Call of Cthulhu Collectible Card Game, but re-released in non-collectible format and now with white card borders (though personally I preferred the black). 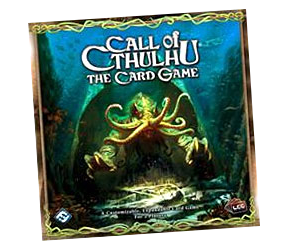 Call of Cthulhu Collectible Card Game was FFG’s first duelling card game and is still going strong many years later as a Living Card Game. Designed for two players, it draws on the rich and detailed background of the stories of master horror writer H.P. Lovecraft, pitting human and monster factions against each other in a game where you can not only lose your life, but your sanity! Agency detectives, Miskatonic University students and faculty, and the members of the mysterious Syndicate all join the fight against otherworldly beings including Cthulhu, Hastur, Yog-Sothoth, and Shub Niggurath. The cards feature some truly stunning artwork from a wide range of artists that really immerse you in the theme. The place to start with this game is the Core Set, which includes a nicely-illustrated game board, rulebook, story markers, plastic Cthulhu domain markers, 10 Story cards, and 155 deck cards. Call of Cthulhu: The Card Game is fully playable out of the box, but when you get hooked you’ll want to start expanding the game with any number of booster Asylum Packs of fixed card supplements and larger boxed expansions. The player aids have an error in the refresh phase. The sequence should be: 1) Restore insane character, 2) Refresh exhausted characters (except for the just restored insane one), 3) Ready domains. You have steps 1 & 2 reversed. It’s not a critical error at first glance but with a card game like this there’s probably a card or two with responses for when characters become refreshed or restored for the timing issues to be significant. It’s correct in the summary but wrong in the player reference cards – though I do notice that exactly the same error is in the rulebook (ie different order in rules text and detailed turn sequence), so perhaps it doesn’t matter the order these steps are in? Anyway, I’ll change it for consistencies sake. Cheers. Maybe they revised the manual? My copy has the detailed rules text and summary the same way. At any rate thanks! Love your work. Actually it’s still not quite right I’m afraid. It’s “ready all OTHER exhausted characters”. You don’t ready the insane character that was just restored. Aaarrghhh ….. will fix. Sorry, it’s been ages since I played this game. A new keyword was added in The Sleeper Below: Dormant. The rules text was excerpted here: https://www.fantasyflightgames.com/en/news/2014/5/5/the-sleeper-below/. Great guide – really helps in learning the game. Another small issue I spotted (tho’ it’s probably not something most players will do anyway!!). 3. Resource Phase: card is played faceup and upside down, not facedown and upside down.